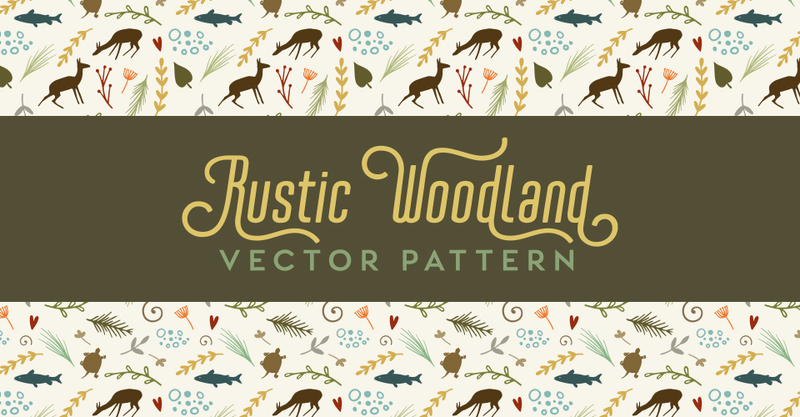 Here’s a little sample vector pattern made with parts contained our recent Free Laurels Set. It also contains cute little deer, fish and turtle from Free Folksy Rustic Woodland Silhouette Vector Shapes from Oh So Nifty Vintage. To grab these cute little folksy critters, just click the image on the right. You can use the swatch as is or use these combined resources to make your own. There’s a file contained in the zip file below that says “Work File” to give you a jump start on editing. If you just want to install the swatches in Adobe Illustrator (paid) or even Inkscape (free) there are instructions for that as well. If you’re new to creating patterns in illustrator, here are a couple of tutorial videos to get you started. It’s not a necessity to link back but I do appreciate it and will pin your post if I get a pingback. Please DO NOT RE-POST these AS IS with no modifications. That’s it! Enjoy.